Young priests of the Church of Milan on pilgrimage to the places of the "Way of the Holy Family"
Cairo (Agenzia Fides) - The celebrations by the Coptic Orthodox Church to commemorate the centenary of the birth of the so-called Sunday School Movement will take place on Sunday, May 13. The centenary will be celebrated in the Coptic Orthodox Cathedral of Cairo, in the presence of Coptic Orthodox Patriarch Tawadros II. Coptic Orthodox Patriarch Ibrahim Isaac Sidrak was also invited to the official commemoration. 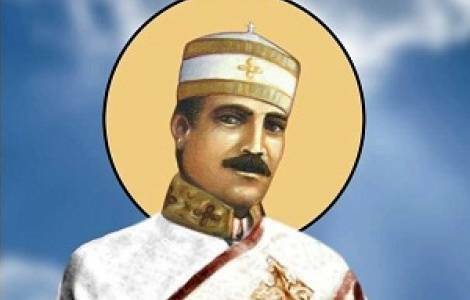 It was the year 1918 when Copt Archdeacon Habib Girgis started the "Sunday schools" network, taking inspiration from the Protestant formula of "Sunday Schools". The initiative, designed to promote the spiritual and theological formation of the laity, had a formidable impact, along with the rebirth of Coptic monasticism, as a tool and occasion for the "Coptic awakening" of last century. "Sunday schools" fostered and nourished the renewal of the entire pastoral care of the Coptic Church, contributing to the formation of new generations of monks and priests who, starting from the period between the two world wars, participated in a firmly rooted "rebirth" in the rediscovery of one's theological and spiritual traditions. The "Sunday schools" movement has helped to shape the theological and pastoral sensitivity of relevant figures in the history of the Coptic Church of last century, such as Patriarch Shenuda III. ASIA/PAKISTAN - Archbishop Arshad: "God, make us an instrument of your peace in Pakistan"